Thank God that we can look to our Lord Jesus Christ each day and find our strength and joy in Him Who loved us and gave His life for us. May this be our comfort and encouragement always! For more Word-Filled Wednesday participants, do visit Amy. Oh, yes He is. I wish that I could smell that flower through this screen. It looks so beautiful and fragrant. Blessings to you. Beautiful flower! This is a great verse to share and a timeless truth. God bless you for sharing your heart. Happy WFW! Don’t you just love this day?!? Thank you for such an encouragement today. Truly the Lord is the source of all of our strength. Beautiful picture also. Be blessed! Yes he is wonderful and that is a beautiful flower and scripture. Thanks. Amen, Nancie! This is so beautiful I just might have to print it! Have a blessed day, my friend! Thank you for your comment on my last post, as well. Quite amazing sights! Amen! God is our strength and our song! He is a melody that is always perfect and a foundation that can never break! God bless you for this wonderful reminder! I love the flower! Roses in bloom are an amazing creation of God's, aren't they? Such a pretty picture. Thank you for sharing! WHATS NOT TO LOVE HERE! That is a great thought! When others fall away, He is still there. I am so glad to know that the Lord can uphold me, even in my weakest times. Aren't we blessed that He is our strength and song. Great, Nancie! I am so glad the Lord provides us strength. This verse reminds me that not only is the Lord my strength, He is also my song. There are no better songs to sing than ones that proclaim the love, sacrifice, hope, comfort and mercy found in Jesus Christ. This verse is so very true in my life sweetie. I love the beautiful picture. Thanks so much for stopping by today. I really like your scripture and picture too. Beautiful verse and rose. Blessings! What a lovely reminder thank you. Your photo is beautiful. BTW than you for stopping in and visiting me and thanks for your sweet words of encouragement. I love this verse because it seems to show both power and tenderness in our God! Beautiful! 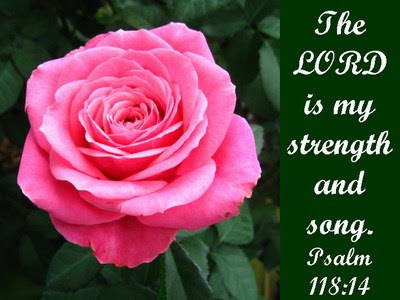 I love the pink rose and the perfect verse to go with it. Thanks for sharing. Thank you, sweet friends, for all your prayers and encouragements. Your encouraging comments mean a lot to me and they really made my days! I thank God for all of you and the way your life have impacted me in my walk with our Lord. May God bless you abundantly!